I know that it’s almost summer, but every time that I read that a grandfather builds a treehouse to his grandchild, it reminds me my grandpa! 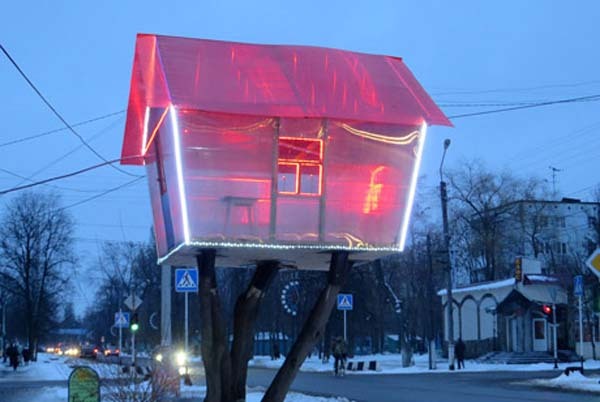 The 69-years old Novozybkov built a treehouse for his 6-years old grandchild on Pervomayskaya street in Moscow during the Christmas time. A very modern and technological treehouse on a maple tree. The walls are made of transparent polycarbonate and for the roof he used a fluo-pink polycarbonate. The LED-lights give a warm and protection feeling from the cold outside. A sort of installation that was also subjected to vandals’ attacks. Anyway I love the contrast between the warm and soft lights and architecture of this treehouse and the cold and biting atmosphere of the surrounding city!